Versace got their social media activities wrong the other day which resulted in an interesting uprising on Facebook. They removed the ability for Fans to post to their Facebook Wall after allowing them free access to post. Fans had been complaining about sandblasting jeans which can result in the worker inhaling silica dust. Several deaths have been reported as a result of this activity according to Mashable. 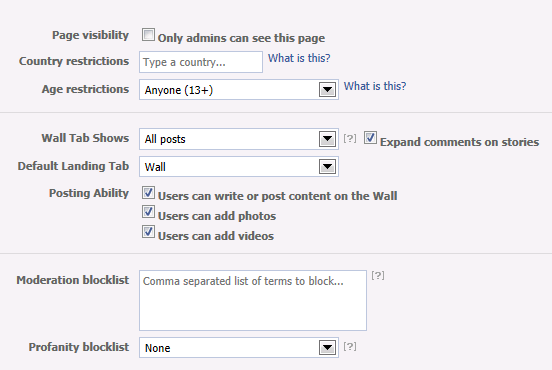 It’s really simple to set appropriate permissions right at the start on your Facebook Page. Its as simple as setting the appropriate check box. But brands, desperate for engagement with their customers, often don’t think of the backlash that can occur if previously allowed actions are taken away. This would have been so simple to avoid, had Versace thought through the impact of allowing something – then taking it away. Getting your plans, strategy and settings right first time can go a long way to avoiding issues like these. And brands like Versace, with a little more planning could have avoided this crisis completely. This entry was posted in Facebook, Social Business, Social Media, Strategy and tagged crisis management, Facebook, Facebook Engagement, sanblasting, versace on July 7, 2011 by eileenb.